RUSH: Despite all of this, Trump’s approval is holding steady — and, in addition to that, the Republicans continue to shrink the Democrats’ edge in all the polling data on the midterm elections. 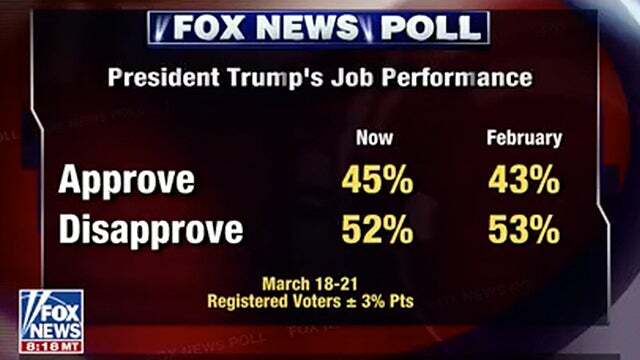 It’s a Fox News poll. It finds Trump’s approval rating “holding steady at 45% and the GOP closing the gap on the Democrats’ lead in terms of which party voters favor in the congressional districts coming up in the November midterm elections. The poll finds Democrats with a 5-point edge in the generic ballot test,” 46% favor Democrats; 54% back the Republican. 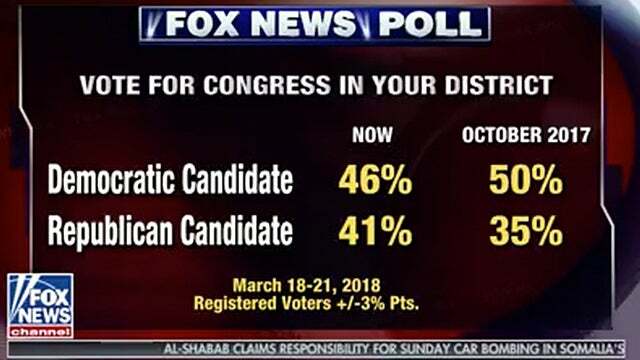 “That’s closer than the Fox poll’s last measure on the question in October when the split was 15 points,” when 50% said they favored Democrats; 35% said they supported Republicans. Trump’s approval rating is just a couple of points above what this poll found in February, equal to its finding in January. “The president scored his worst reviews in the survey on handling the opioid epidemic, one-third approving, 46% disapproving.” So despite all this, Trump’s numbers remain solid. His approval numbers are inching up in practically every poll. In direct contrast to what you see every day in the Drive-By Media, the Republicans are closing the gap on the generic ballot in the midterm elections. The media is already reporting that the Democrats have essentially won, as they did with the student march on Saturday. “This is just another sign that it’s over! The Democrats are going to win the House.” You even hear Republicans conceding this now. “The Democrats are gonna win.” In fact, if you go to certain places you can almost hear certain Republicans seem like they want that to be the case — I’m not kidding — and I think they are Republicans in the leadership in both the House and Senate.